The Big Bang North West is a STEM celebration for school children and part of a programme led by EngineeringUK. Big Bang events enable young people to discover the exciting and rewarding STEM based careers available in their local area via fun, interactive activities. 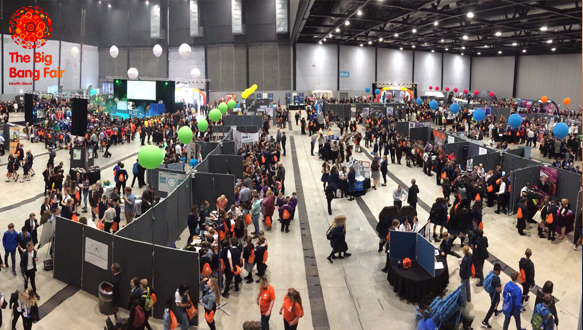 Along with all of the amazing stands, shows and exhibits, The Big Bang North West hosts the regional finals of The Big Bang UK Young Scientists & Engineers Competition. The Big Bang North West 2019 is coming to the Exhibition Centre Liverpool on the 2nd of July 2019. Are you a school looking for FREE tickets for this exciting, educational event? Are you a business or organisation looking to sponsor a high profile STEM celebration? Perhaps you’re an activity provider, educational institution, performer or show organiser who would like to play your part? If you want to be inspired or inspirational, click the links below!